Hello lovelies, and Happy Easter Sunday! Today I have my Easter Bunny Ear nails to show you. 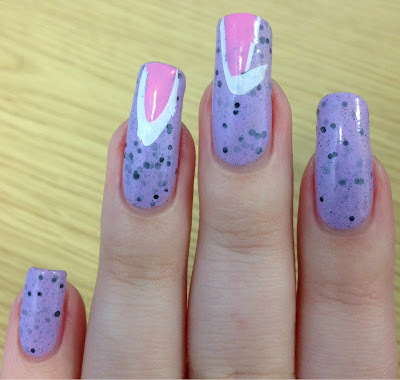 Kirsty over at FairyTales Nails sent me Illamasqua 'Speckle' in our recent swap (post here). I decided straight away that I had to wear it for Easter. To make it more fun I wanted to add some bunny ears, and ended up making my first ever stamping decals! Read on for more info and to see how it went! 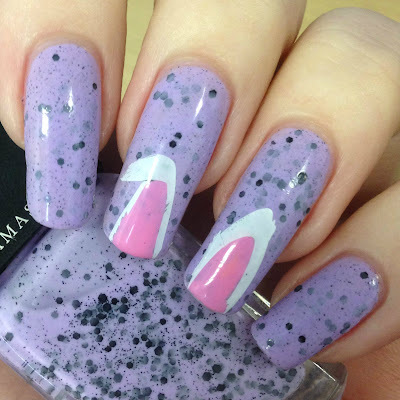 Illamasqua 'Speckle' is a pastel lilac full of black microglitter and small black hexes. The formula was super smooth and easy to apply, and the glitters spread out evenly. It was opaque in two coats except for a few bald spots I caused playing with the glitter placement. Below is three thin coats and topcoat. 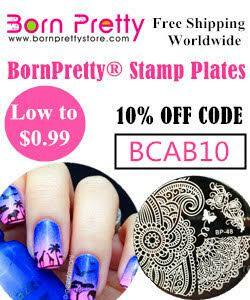 To create my bunny ear decals, I started with Bundle Monster stamping plate BM-H09 from the 2013 Holiday Collection. I used Hit The Bottle 'Snowed In' to transfer one of the bunny ear images to my stamper head. I did the same with the other ear on a second stamper and let them both dry for a couple of minutes. I coloured the middle of each ear pink with a dotting tool and OPI 'Look At My Bow!' (swatched here) before waiting 10 minutes and adding a generous coat of Barry M's 'All-In-One' topcoat. I left both ears a further half an hour to make sure everything was completely dry. I then carefully peeled each decal off with a pair of tweezers. This was sort of the moment of truth for me, and they both came off in one piece! I lined up the ears on my middle and ring fingers, moving them around until I was happy with the placement. Using my fingertip, I smoothed them out to remove any bubbles or wrinkles and added a coat of quick dry topcoat to seal them in. What do you think? I'm ridiculously proud as this is the first time I've even attempted to make decals! I like to think the Easter Bunny is sneaking around with his eggs and I've just managed to catch a glimpse of his ears. I definitely need a mat now so I can play with some more advanced stamping! I'd love to hear any tips you have. I hope you're all having a nice relaxing weekend full of lots of chocolate. I'm off to my mums with a bag full of Easter eggs to have a big roast - yum! So cute! I have to try to make decals sometime. Oh I just love how you did the ears with one on each nail....Love! I have Illamasqua Speckle also, I usually rotate between Speckle and the Hatched polish I just blogged about. Very cute! I remember when all these "speckled" polishes came out and I wasn't super keen on the idea, but now, I find myself actually wanting some of them. haha. Strange how you sometimes need to see a couple of cool nail art looks before getting convinced a polish type is for you.